Locale-adaptive pages change their content to reflect the user's language or perceived geographic location. Since, by default, Googlebot requests pages without setting an Accept-Language HTTP request header and uses IP addresses that appear to be located in the USA, not all content variants of locale-adaptive pages may be indexed completely. As these new crawling configurations are enabled automatically for pages we detect to be locale-adaptive, you may notice changes in how we crawl and show your site in Google search results without you altering your CMS or server settings. Note that these new configurations do not alter our recommendation to use separate URLs with rel=alternate hreflang annotations for each locale. We continue to support and recommend using separate URLs as they are still the best way for users to interact and share your content, and also to maximize indexing and better ranking of all variants of your content. For artists: if you mark up ticketing links along with the events on your official website, we’ll show an expanded answer card for your events in Google search, including the on-sale date, availability, and a direct link to your preferred ticketing site. As before, you may write the event markup directly into your site’s HTML, or simply install an event widget that builds in the markup for you automatically—like Bandsintown, BandPage, GigPress, ReverbNation or Songkick. The marked-up events found on the other event site's page will then be eligible for Google events features. Examples of sites you can point to in the “event” field include bandpage.com, bandsintown.com, songkick.com, and ticketmaster.com. Hey funny people! We want your performances to show up on Google, too. Just add ComedyEvent markup to your official website. Or, if another site like laughstub.com has your complete event listings, use delegation markup on your home page to point us their way. Last but definitely not least: we’re starting to show venue event listings in Google Search. Concert venues, theaters, libraries, fairgrounds, and so on: make your upcoming events eligible for display across Google by adding Event markup to your official website. As with artist events, you have a choice of writing the event markup directly into your site’s HTML, or using a widget or plugin that builds in the markup for you. Also, if all your events are ticketed by a primary ticketer whose website provides markup, you don’t have to do anything! 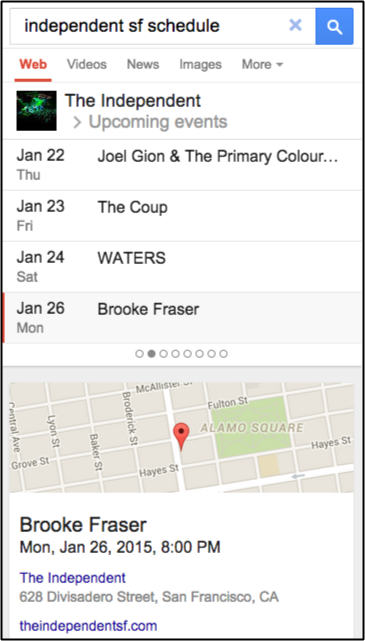 Google will read the ticketer’s markup and apply it toward your venue’s event listings. For example, venues ticketed by Ticketmaster, including its international sites and TicketWeb, will automatically be covered. The same goes for venues that list events with Ticketfly, AXS, LaughStub, Wantickets, Holdmyticket, ShowClix, Stranger Tickets, Ticket Alternative, Digitick, See Tickets, Tix, Fnac Spectacles, Ticketland.ru, iTickets, MIDWESTIX, Ticketleap, or Instantseats. All of these have already implemented ticketer events markup. Please see our Developer Site for full documentation of these features, including a video tutorial on how to write and test event markup. Then add the markup, help new fans discover your events, and play to a packed house!